Looking for a jaw-dropping elegant but scary door hanger to haunt your house this year? 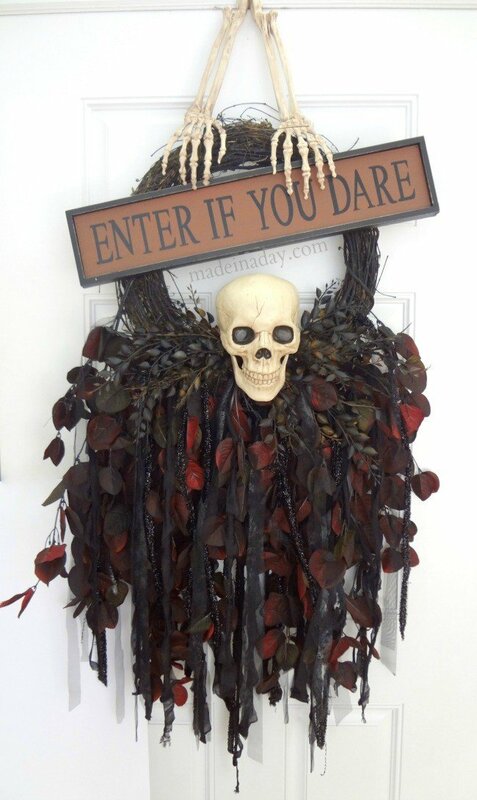 Then this Creepy Skeleton Skull Wreath is the to frighten your neighbors this Halloween! For more creepy projects see my Halloween page. Halloween decorating season is in full swing and I’m in love with all things spooky! If you are a regular reader you would know this is my favorite time of the year! I was asked to join the Celebrate the Season Joann Fabrics Campaign Halloween themed project this year. I was so excited to be a part of this year’s Halloween fun! I came up with a Creepy Skeleton Skull Wreath for my front entryway! He is super scary but has a sense of elegance at the same time. Here’s how to make one for your haunted house this year. 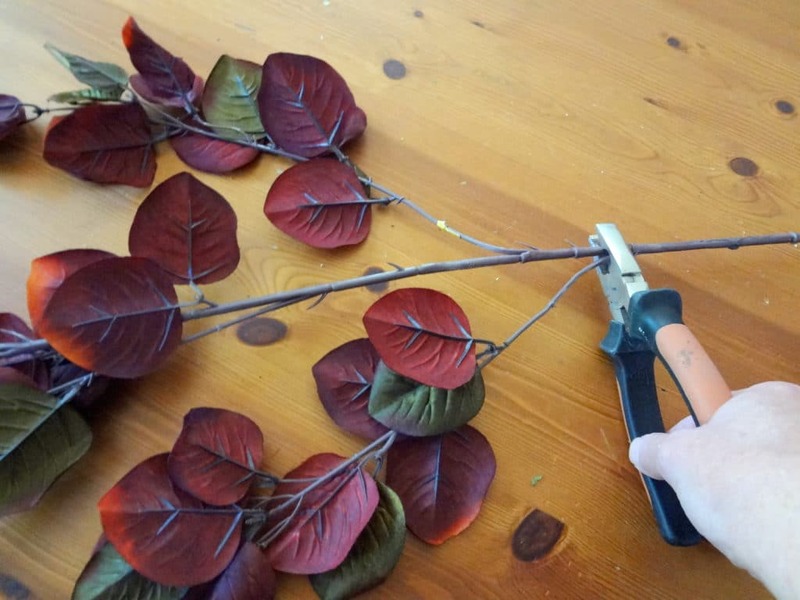 Using pliers, cut the long stems off to the leafy part of the 6 long foliage stems. Cut the branch closest to the end of the stem off and set aside. Place the long stems about 3 inches apart around the bottom of your wreath. Bend the wire end and hook them in between the wreath vines. Secure them with floral wire to the wreath. Place the 6 smaller stems (the ones you cut off of the long stems) between the 6 long stems and secure with floral wire. Cut the smaller bush apart from the base with pliers leaving the stems long. 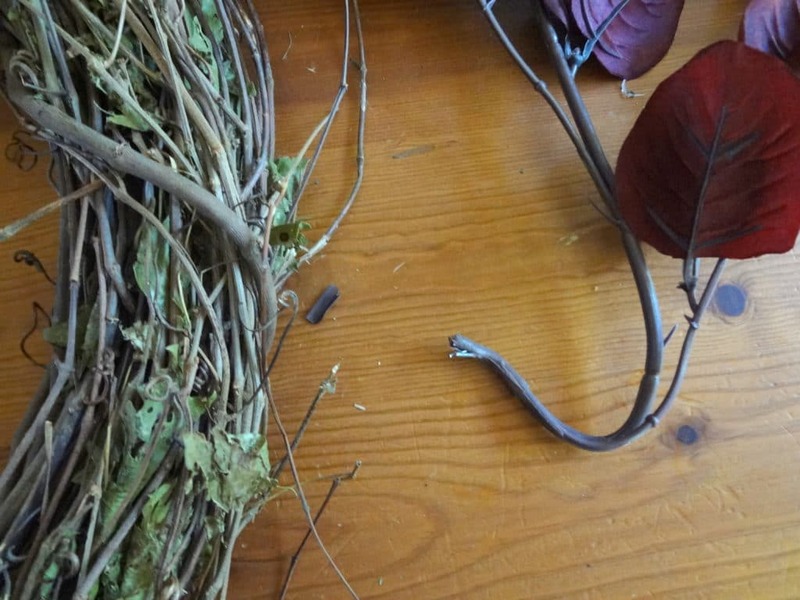 Place them in the bottom of the wreath to cover the base of attached long stems. Do not attach them. 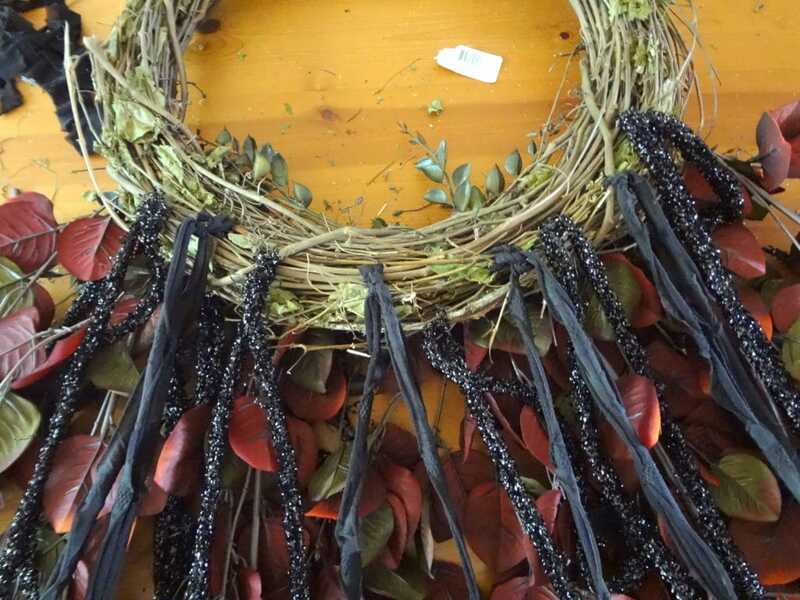 Lightly spray paint the foliage and the wreath with Flat black spray paint. Let it dry. 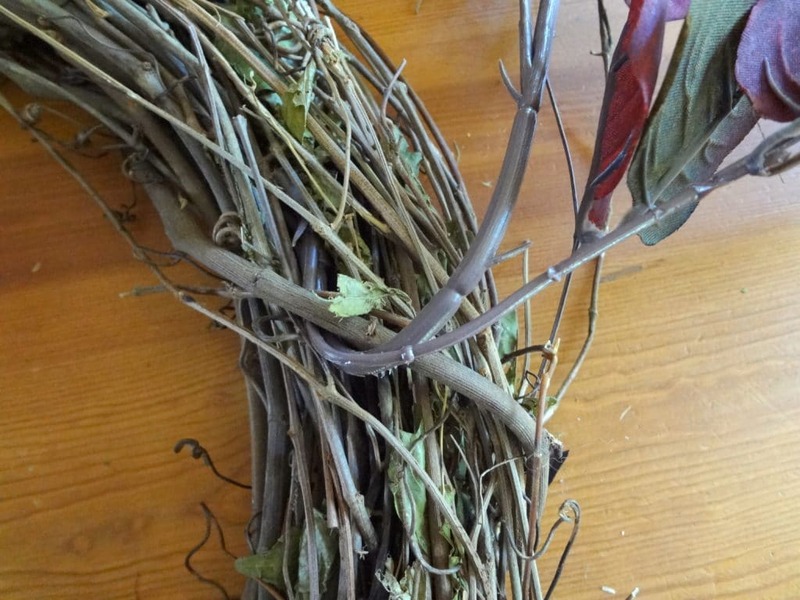 Remove the stems from the small bush from the wreath. 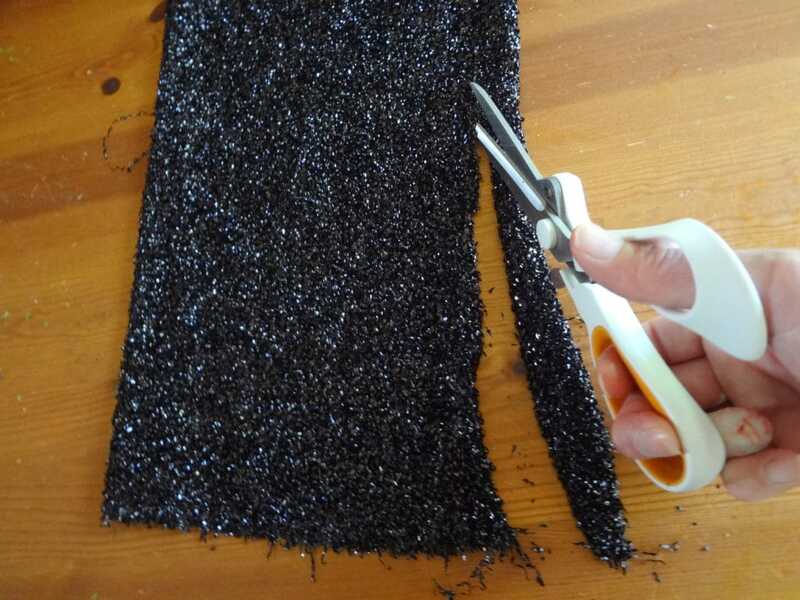 Cut your fabric into 1 inch wide long strips. Tie the fabric to the back and front of the wreath between the long stems. 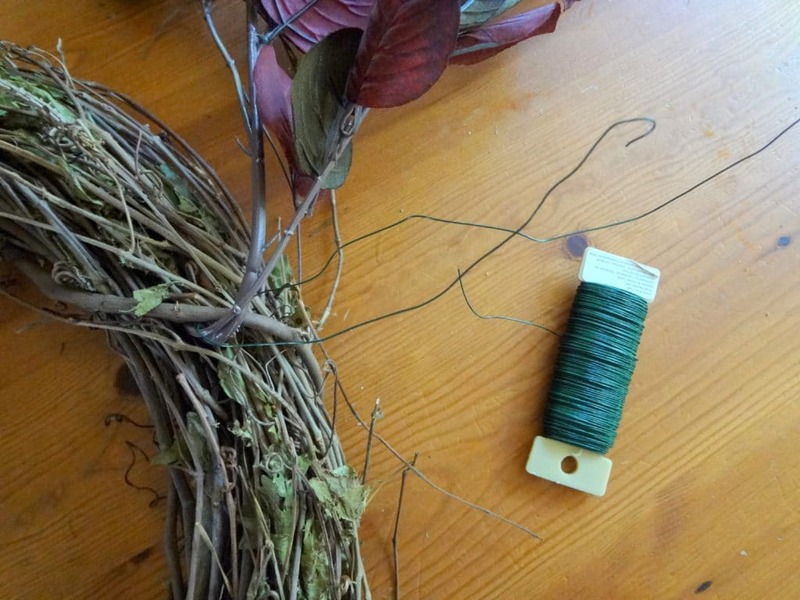 Add your bush stems back to the top of the long stems and attach with floral wire. Remove the stakes from the skeleton arms with a screwdriver. 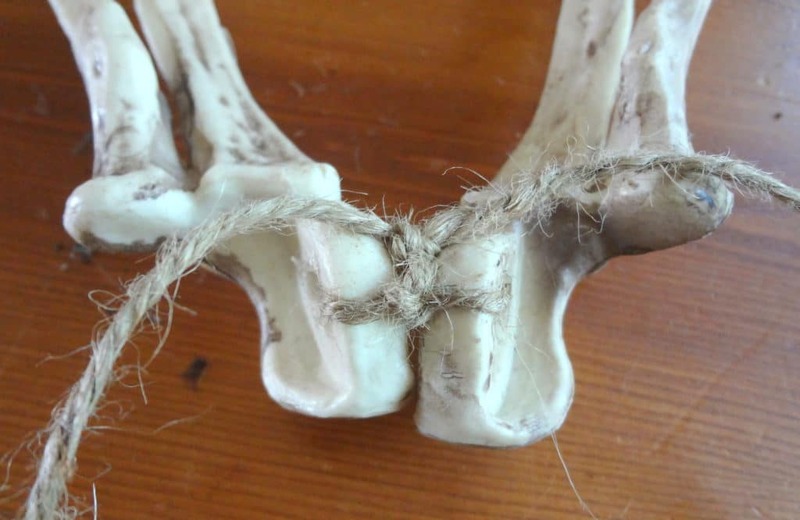 Tie them together at the elbow tightly with twine. Attach the arms tightly with floral wire through the base of the fingers to the top of the wreath. 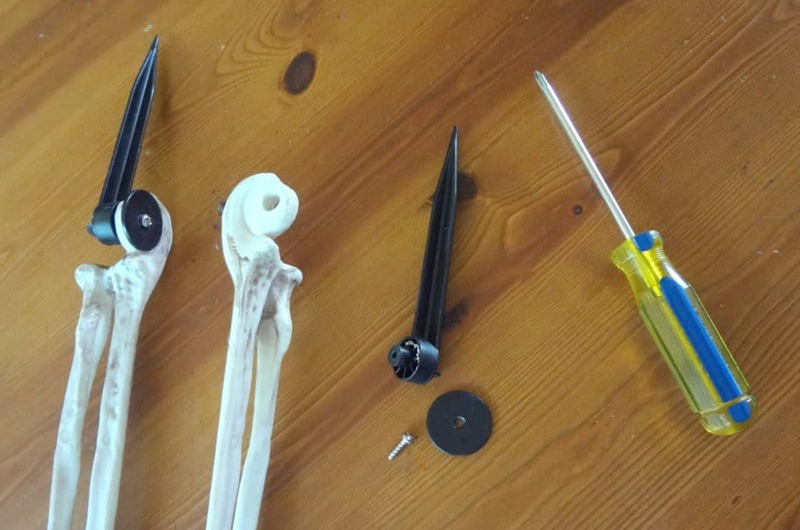 Make a small hole in the base of the skull with the screwdriver. 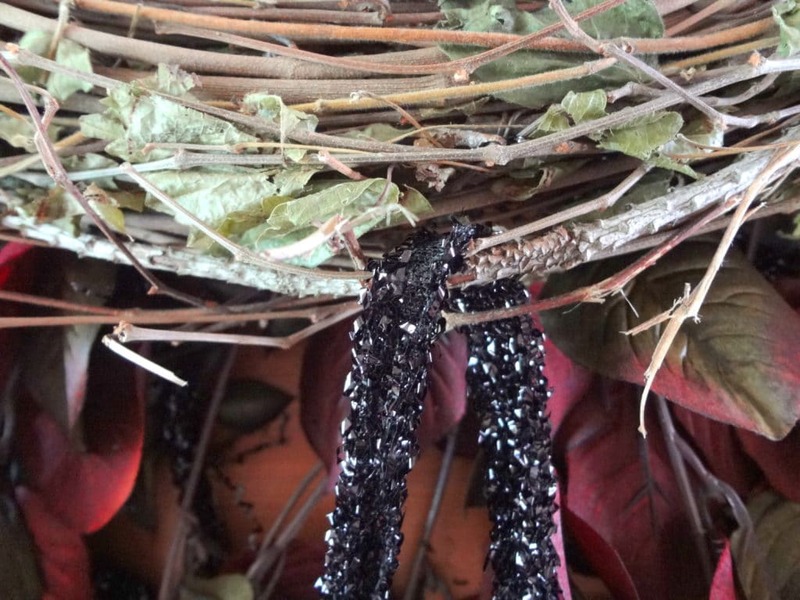 Feed the floral wire through the holes and attach to the inside of wreath over the small bush stems. 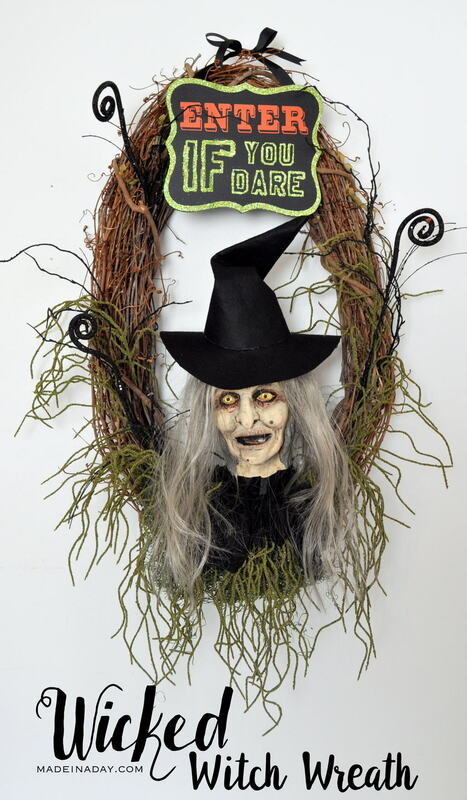 Place your Halloween sign and attach with floral wire, and that’s it! Super spooky for your Halloween entryway! Love this! I must say you are talented! One of my coworkers saw a picture of your wreath circulating on Facebook and jokingly said I could make it. 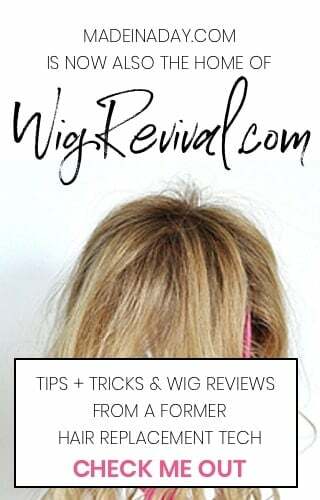 I ended up googling, found you blog and with your help I was able to make it! I would love to share it with you!! This is a great Halloween project! Thanks for sharing it at The Pin Junkie Link Party. This project was featured in a HUGE Halloween roundup. 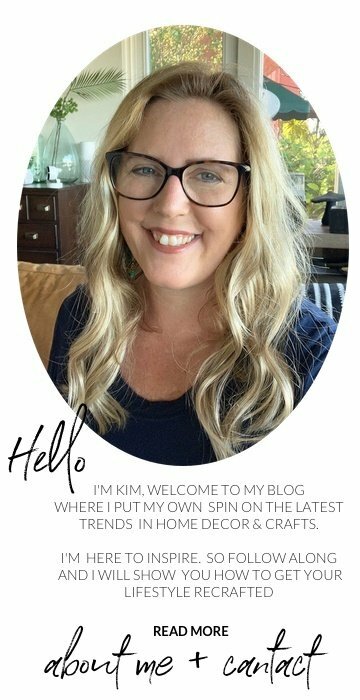 Hope you can stop by to grab a button and let everyone know that you were featured on The Pin Junkie. 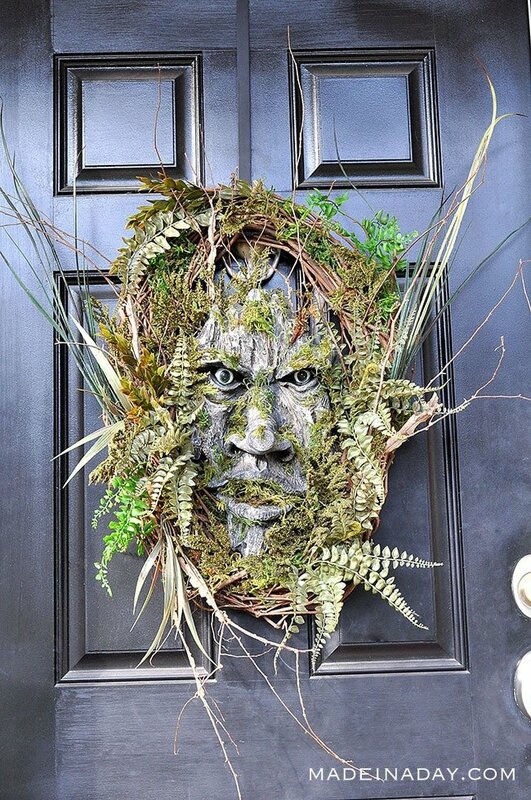 Your wreath has just the right amount of creepy! Love it! How can something be creepy and cute at the same time? Thanks for sharing this at our Making Monday link party. We appreciate you. I’m pinning this to our Making Monday board to share with our followers. Have a fabulous weekend. FEATURING this on The Patriotic Pam tonight when my Weekend Link Party goes live at 7pm. I love it! Thanks for linking up. Please come by and check it out. I love this wreath! 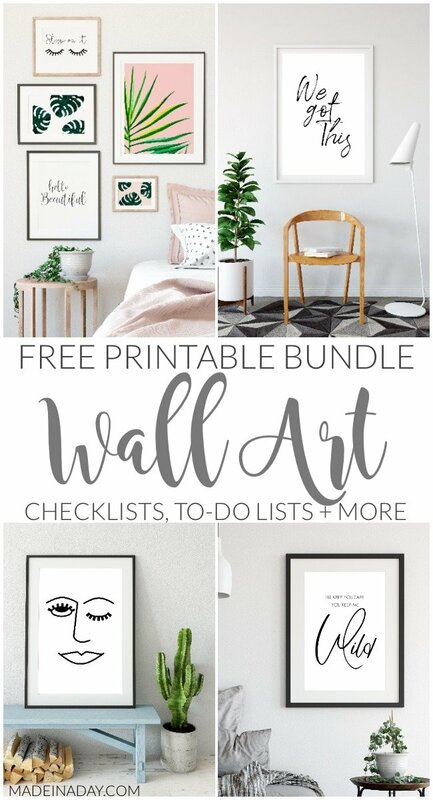 I’m pinning it, and featuring it this week on Planned in Pencil… I know my readers will appreciate that coupon! Thanks for sharing it at the Pinworthy Project Party. Oh man, you are becoming more and more amazing!!!! Fancy that wreath! 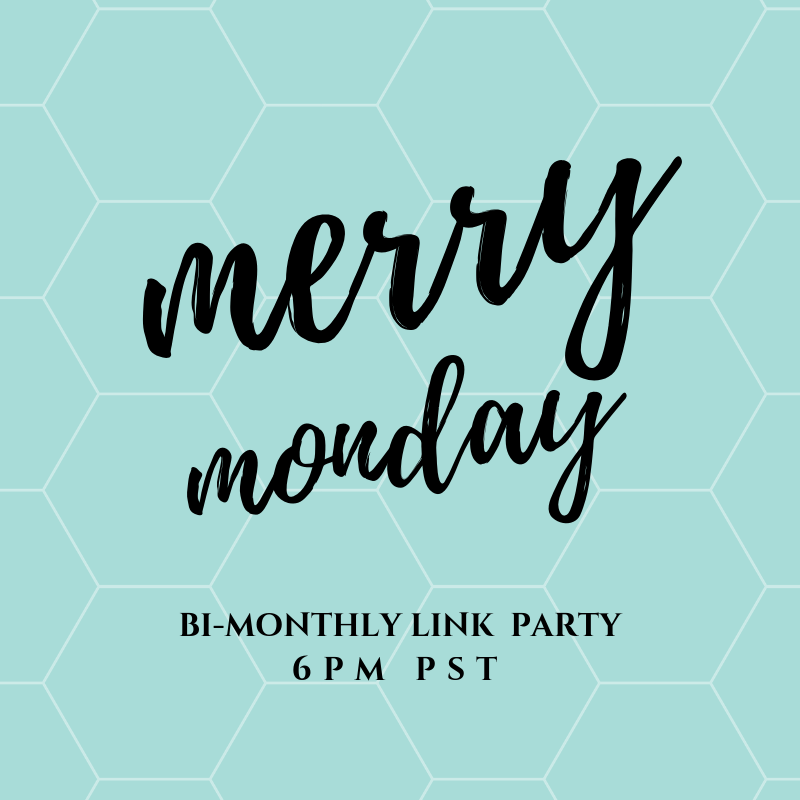 I’m swinging by from Give me the Goods Monday!! You can find me at Look forward to having you visit!! Seriously Amazing Kim!! 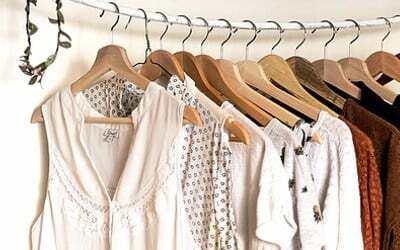 Thanks for linking up to Tickled Pink Times Two. Pinned. This is SO cute! I’m going to have to grab the stuff to make this this weekend! This looks so great! 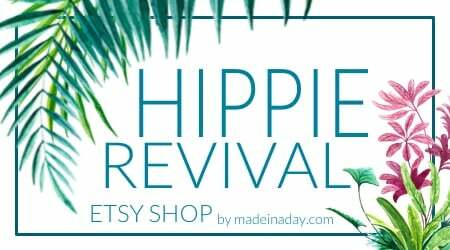 I’d love if you’d link up to The DIY’ers. Wow Kim…AMAZING job! I just love this…love the layers of fabric and leaves. Pinning this now! I absolutely love this wreath! I love the skeleton arms and the fall foliage. This is such a wonderful wreath, and I’m pinning it! Love this wreath! Super creative and unique. Thank you!! Kim, what a wreath! Seriously, that’s the coolest, creepiest! I love it! Thanks so much for linking up to the DIY Sunday Showcase! I love the wreath!! You did a fantastic job! I love the way you broke down the instructions so it can be created easily. You are so creative. What’s next? That is pretty awesome! I love all the foliage! I’d love for you to come join our Halloween Party!!! I love this wreath! Halloween is my son’s favorite holiday. This wreath would be a great project for us to do together.